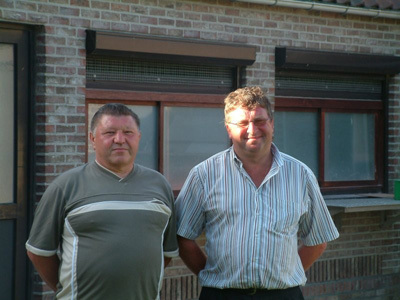 Home › News & Articles › Reports › Maroy Geert, "Winner of hard Limoges national against 15364 yearlings (2006)"
Maroy Geert, "Winner of hard Limoges national against 15364 yearlings (2006)"
‘ De Zitter’ (‘The Sitter’) is the name of the winner of the Limoges Yearlings race of this year. As you will probably already have gathered from his name, this is not a pigeon that hurries to enter the loft, on the contrary, ‘De Zitter’, ring number 3115621/05, got this name because after each race, he used to sit on the roof for several minutes. He only displayed this behaviour as a young pigeon: once he understood that his hen was waiting for him when he’d arrive, he started entering a lot quicker. 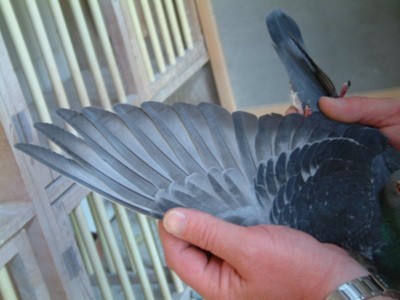 Unfortunately, he lost a lot of top prizes as a young pigeon because he remained on the roof. In the Ablis race for example, he managed to win a 4th prize against approximately 500 pigeons in Rekkem, after sitting on the roof for about 10 minutes. He also acquired a 22nd prize in Rekkem in the Bourges race, after spending approximately 16 minutes on the roof. The national winner Limoges yearlings "De Zitter"
The yearlings that went to Limoges were prepared as follows: Clermont, Dourdan, Orleans, Chateauroux and 2 weeks ago they did Argenton. ‘De Zitter’ was remarked in several of these preparatory races. He could have won a 1st prize in the Orleans race against approximately 800 pigeons, but since this race was considered as a training the pigeon was not registered and obtained no prize. 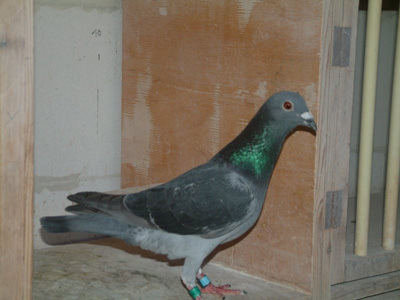 He was 8th in the Dourdan race against about 300 pigeons and he obtained a 51st prize against 581 yearlings in the last preparatory race (Argenton). 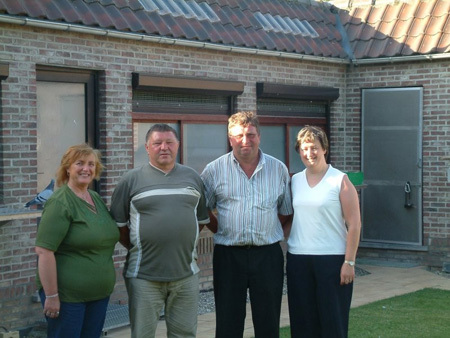 Geert achieved a round of youngsters in 2001 from the BlaVanWo team. The original buyer of this round of youngsters had cancelled which offered Geert the opportunity to take the birds over at a nice price. 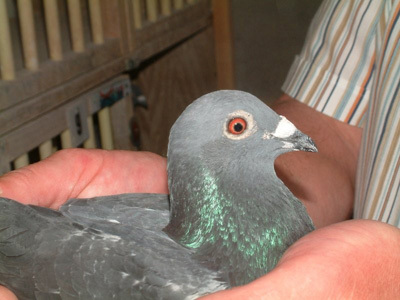 As Geert bought a round of late youngsters, it was not possible to breed with the pigeons until 2002. The Limoges winner descends from these pigeons (a.o.). The father of ‘De Zitter’ was born in 2003 and is a pure BlaVanWo pigeon. His pedigree also shows some Vandenabeele blood. 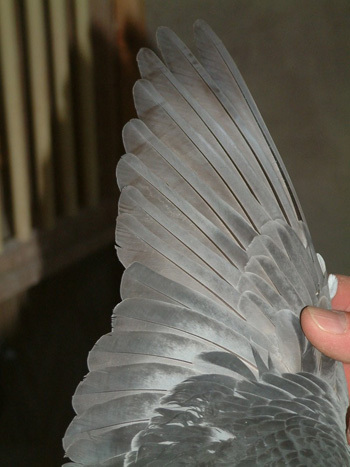 The mother of ‘De Zitter’ is a pigeon of the Maurice Verheyen strain. Geert’s assistant Willy Putman helps him to look after the pigeons. His main job is to take care of the youngsters and train them. The yearlings and old pigeons are under the supervision of Geert himself. When they are training, the youngsters are regularly released 20 to 30 kilometres further away. Geert and Willy try to release the birds on the same spot where a group of sometimes more than 1.000 pigeons is released by a club situated close to Geert’s town: Heestert. “That way, they immediately learn to break free from the flight”, says Geert. The weather conditions for this Limoges race were no picnic. We knew in advance that the stage would not be taken by flashes in the pan. A race flown in temperatures of nearly 30° and in head wind, automatically implies that the strong birds end up in top positions. The pigeons were not expected before 3:30 PM because some shorter races that day showed that the first pigeons would hardly make it before 4 PM. So Geert started to basket some young pigeons and fortunately, he had explained to his wife how to register pigeons just in case one would come home from Limoges. ‘De Zitter’ arrived at 3:31 PM. Not only did he obtain the best national speed but he also was the first pigeon reported in the whole of Belgium.